As a part of every lead nurture program, brands use research, focus groups and customer service or sales logs and more to map their customer (or prospect) journey and the mindset of those people. Once this map is created, it’s easier to brainstorm what the person’s unmet need is at every stage that you can possibly answer with content or interaction. I like to start by imagining the first question the user has where the answer might end up being my product. We can use data, interviews, and surveys to find the starting point where the consumer identifies their need. Using the iconic sales funnel and stage of the funnel, identify the steps your typical customer might take in researching the category, identifying the brands, differentiating the brands, determining their feature priorities, interpreting the brand personality, establishing trust, asking questions, viewing product materials, asking friends and finally, making a decision. If the person is thinking about taking a vacation and my role is to sell Australia as a destination- the first question they ask could be, “Where should I go on vacation?” I can validate that by thinking- if someone has that question, do I want my product to appear in her list of answers? While I might not want to have a paid ad appear on that high funnel of a discussion, certainly an organic article or message would help. But maybe this is too high above our sales funnel. In any case, it’s important to know what the entire journey looks like and then decide what parts of the journey you can influence and should address. Once you have the stages mapped you can start thinking about what the customers’ needs are at that point, what questions do they have and what content can you provide to move them forward in their decision-making. 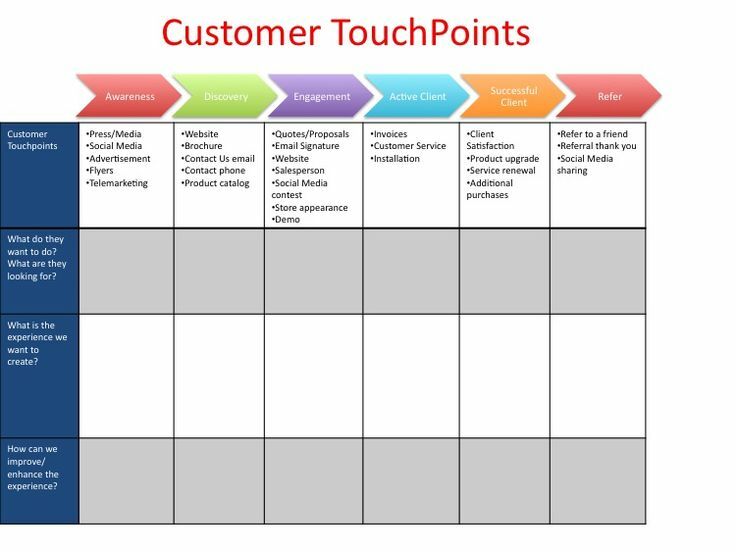 While working as a senior manager of content marketing I developed our customer journey map to identify the right content at the right time. 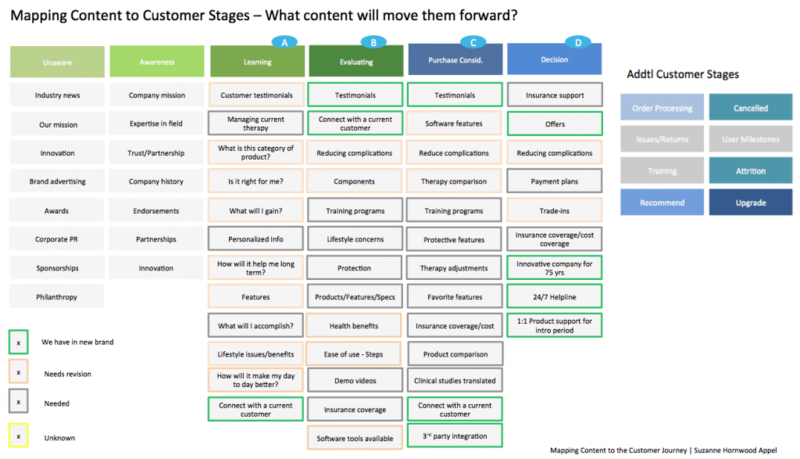 When creating the content topics ask yourself, ‘What information does the customer need to move forward to the next stage?’ Below is the result of one mapping project for a customer segment. I’ve had to generalize the topics to protect confidential information so imagine that the topics represent 1-3 pieces of content each and a variety of formats (articles, videos, graphics). In the example below we chose to focus our Phase 1 content on the four columns marked with letters. The letters represented their position in the funnel and familiarity with our products. It was our shorthand way to label the streams. I like this very simple worksheet for a high level approach. I’ve created a few like this for clients but of course, you’ll want to customize for your own business. You can imagine that much of these content assignments will be placed onto the map based on your own understanding and assumptions of the target audience. And that’s OK. Plan to create your communication program in phases and identify ways to test the content, the order of the content, the length of the content etc. You may be lucky and have starting points in your data and you may have to fill in with informed assumptions. There will be endless opportunities for testing and optimization based on the performance of the live creative. Don’t let the content planning task cause a roadblock, the real learning will come as the program goes into pilot.